I have three different styles of handwriting that I switch around depending on my mood. My main signature, however, looks like it does from years of *cough cough* forging my mom's signature...WITH her permission of course (at least most of the time). 1st-3rd grade: "Hey mom, I need a note for school." "You write it and then I'll sign it." 3rd-5th grade: "Hey mom, I need a note for school." And then she'd forget to sign it... so I would do it. 5th grade & up: I didn't bother asking her anymore. What does your writing look like? Do you have one style that you use all the time or do you use different ones for different occasions? Did you ever forge your parents' signatures? Come on, surely one of y'all will admit to being the kid who had the stash of hall passes and excuse slips in their school locker. The only time that I remember forging my father's (impeccable!) signature was in the second grade when he wouldn't give me permission to get out out of class in the afternoon to attend The Good News Bible club. That's right! Rebel for Jesus, I was. SNORT. Nope no forgeries here...I could however forge a couple of my friends' parents signatures (don't ask). However, I did turn 18 early on in my senior year and excused myself from school A LOT. LOL! I never would have been able to forge my Mom's as hers is very unique. I still can't copy it. I did go through a whole SLEW of personal siggy's...trying to FIND myself. My favorite time in my life was when I emulated my Dad's handwriting. The funny part is he is left-handed and I am not. It was a pretty cool siggy, but didn't stick. Can you believe that I never did forge my parent's sig. (without their knowledge). I was quite the perfect child. Bwahahaha! Ok. Don't judge me....this was yeeeeeeeeears ago. :P Anyway, I think I forged daddy's name a time or 2 on my progress reports. One year I also forged an early release slip with almost all of the marching band students who were in my geometry class because we wanted to load the bus early for a band trip. :P I got caught for all of the incidences. Grounded for forging daddy's name and 2 days of detention for forging the early release slip. I wasn't a "bad" girl, I was just a quiet girl who quietly got in trouble....a few times. HA! LOVE YOU! I may have once or twice in highschool. I do have different handwriting. I remember practicing handwriting on my own when I was a kid. I wanted nice handwriting and couldn't figure out what I liked best. 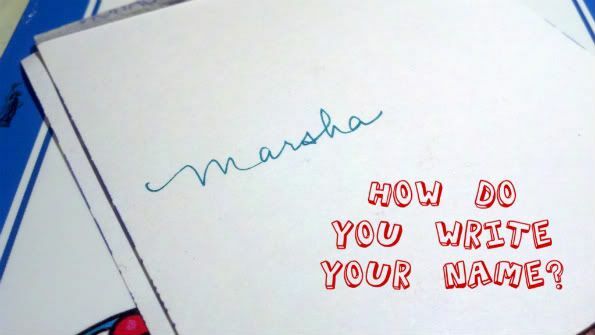 I can do the print, print/cursive combo that is straight up and down or do the full cursive slant. I sometimes mix them all!